A grand Vietnam War nightmare, The Deer Hunter strides fearlessly towards bombastic audaciousness. Michael Cimino fulfills the film's promise to poke at the most tender open wound of America's psyche, and The Deer Hunter stands as a landmark cinematic achievement. A 180 minute tragedy in three acts, the first hour introduces the small, working class steel mill town of Clairton, Pennsylvania in 1968. Friends Michael (Robert De Niro), Nick (Christopher Walken) and Steven (John Savage) are about to join the military and be deployed to Vietnam, leaving behind the rest of their hunting buddies Stanley (John Cazale), John and Axel. Before leaving Clairton, Steven marries the pregnant Angela (Rutanya Alda), while Nick commits to marrying girlfriend Linda (Meryl Streep) once he return from the war. After Steven's wedding, the guys take one final hunting trip. In Vietnam, Michael, Nick and Steven witness gruesome action before being captured by a Vietcong unit, with a deranged commander who tortures prisoners by forcing them to participate in Russian roulette as a gambling game, with Steven held in a rat-infested underwater cage. After a harrowing helicopter rescue is only partially successful, Michael survives the war traumatized but without physical damage and returns to Clairton. His buddies are not quite so fortunate, each introduced to a unique new hell. Michael has to try to pick up the pieces of his life, including trying to find and reconnect with his friends, and he will discover that surviving the battlefield does not always mean surviving the war. 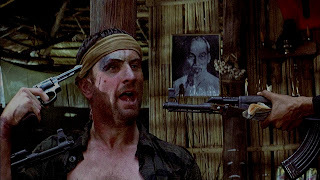 Cimino does not waste any opportunity to amplify the impact of The Deer Hunter. From the brassy 51 minutes dedicated to the wedding, to the insane intensity of the Russian roulette nightmare, to the incredible prolongation and extension of scenes that would otherwise pass unnoticed (a side-of-the-road piss on the hunting trip becomes an excuse for an endless frat boy joke), Cimino goes intentionally overboard. Amazingly, he achieves the desired impact. 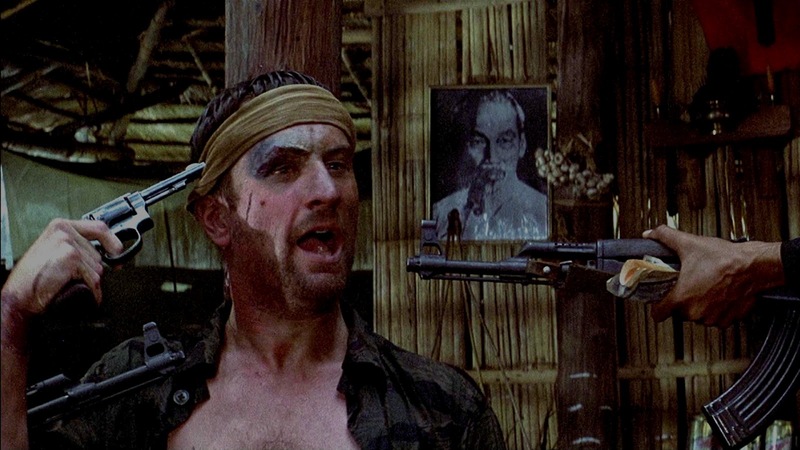 The Deer Hunter is an unforgettable and haunting journey, normal men torn away from the mundane American heartland and thrown into a faraway and surreal war zone. The relaxed time that Cimino dedicates to tell their story serves to deeply humanize Michael, Nick, Steven and their community, maximizing the impact of the permanent post-war damage that all will suffer. A cast of current and future Hollywood royalty add to the lustre of The Deer Hunter. Robert De Niro, standing at the peak of his career, holds the core of the film together, and represents the men who were never the same, but suffered an almost manageable impact from the war. Michael is a mountain man, a killer rifle shot, and the most well equipped of his friends to survive the horrors of war. His economy of words gives way to fanatical persuasive powers when survival is at stake. Christopher Walken won the Best Supporting Actor for his portrayal of Nick, a man forever intoxicated by the dance with death. Representing the men who either never came back from the war or who suffered such severe mental damage that they wished they hadn't, Walken gives Nick a facade of ruggedness over a personality susceptible to unforeseen emotional sides-wipes. John Savage's openly vulnerable screen persona is perfect for the role of Steven, doomed to agony from the moment Angela fatefully spills those almost unnoticeable drops of red wine on her white wedding dress. After her brief debut in Julia, The Deer Hunter was Meryl Streep's first meaningful role and she makes an immediate impact as Linda, resourceful on the home front, hopeful for the return of her man, and then adapting to the emotional realities of a new post-war world. Streep was nominated for a Best Supporting Actress Academy Award for a complex performance that mixes playfulness, strength, hope and resignation. Cazale was already diagnosed with terminal cancer before filming started, and died several months before the film was released. His final performance as Stanley is a perfect summary of his career, a man naturally marginalized and ever so slightly unhinged for reasons that are never quite clear. The Deer Hunter ends with a hopeful rendition of God Bless America, the small community of Michael's friends beginning what will be a long healing process. It's a perfectly bittersweet and poignant ending to an exalted drama.